This resource provides a series of templates/options for developing data-driven feedback loops that are proven to help you change behavior and create collective impact. At Living Cities, we think of the use of data for collective impact as a continuous “feedback loop” that helps you change behavior and create systemic change in communities. The goal of this data-driven feedback loop is learning and improvement. 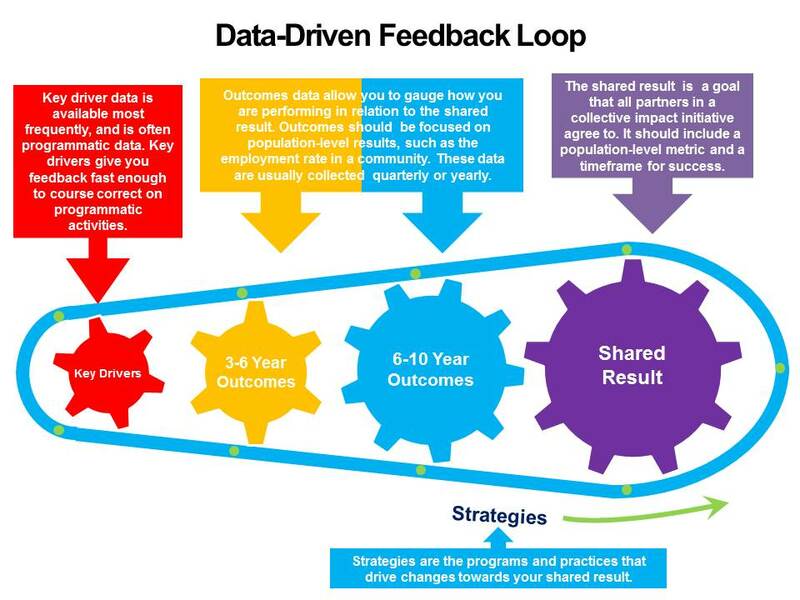 We break this feedback loop down into four components: key drivers; 3-6 and 6-10 year outcomes; and a shared result. A data-driven feedback loop ensures that strategies are both aligned and on track with the overall goals of the initiative. Download the resource at the top of this page to see two different examples of a data-driven feedback loop. By definition, the data used for the feedback loop are updated based on what the initiative is learning, so while these examples are real, they only represent a point in time for the initiatives they represent. The first is from our partners at the Network for Economic Opportunity and the second is from our partners at All Hands Raised. The example from All Hands Raised uses a slightly different graphical representation for the data-driven feedback loop, but the main components are the same. Results Based Accountability (RBA): We’ve used this with our Integration Initiative sites, and most have found it a helpful way to develop shared measures and tracking those measures at a population level. One challenge we’ve seen with RBA is using the approach as a performance management framework to improve programs. The example in the resource from the Network for Economic Opportunity is based on an RBA approach. A3 tool: Our Prepare Learning Circle sites have used the A3 tool for their continuous improvement processes. The challenge with the A3 has been connecting the population-level metrics to the programmatic metrics. The example in the resource from All Hands Raised is based on the A3 approach.